Question: What about comprehension? Will I still be able to understand what I'm reading? Answer: YES!!! Comprehension is the whole point of reading! This course emphasizes comprehension and contains a total of 6 timings with comprehension checks. 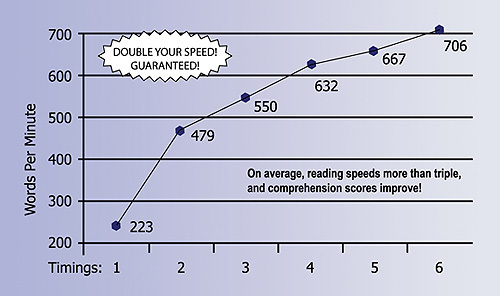 Over all, comprehension improves with faster reading and for many, the improvement is dramatic. Question: How fast will I learn to read? Answer: Participants begin at an average of 225 words per minute. By the end of the 6 hours of instruction, typically their reading speed averages over 700 words per minute. Question: What is the success rate of this course? Answer: 99.5%, or 199 students out of 200, double their speed (or more.) Many students triple or quadruple their speed (or more!) Evelyn gives a lot of individual attention during each class and is highly committed to the success of each student. Question: What ages attend your course? Answer: Grade 5 level reading up to Seniors - all are welcome! Question: Can anyone, even I, learn to speed read? Answer: YES!! ANYONE CAN LEARN!